If you are jumping into ThruLines with gusto this week, my advice is to read this posting about it by Roberta Estes in her blog DNA Explained soon. She and I are not saying don’t use ThruLines. Instead, we are saying to be cautious about what you put into your tree! As Roberta says, you are entering Gator land …. Perhaps I should hold a session again on using Feedly as a blog consolidation tool. Humm. Anyone interested in a “team teaching” session at the MoCoGenSo or the DNA Sig meetings? If so, send an email or talk to Shelley or Barbara. This entry was posted in Other on March 12, 2019 by MoCoGenSo Webmaster. We discussed the Cookie problem when using ThruLines in AncestryDNA. It has been posted in the web that clearing cookies before going into Ancestry will solve the disappearing Thrulines problem. But many people do not know how to clear their cookies! We know AncestryDNA is working on the issue, but they can’t rush a fix since this is their bread-n-butter system. Suggestions have been made as a workaround that should help those who don’t know how to clear their cookies. In Chrome simply open an Incognito window by clicking on the 3 dots in upper right corner and then click the menu item before going into Ancestry. In Firefox, open a Private window via similar right click menu. This should work in all OS types, Windows, Apple, Linux. See Kitty Cooper’s blog for more information about ThruLines in general and the note about the work around. This entry was posted in DNA, How To on March 10, 2019 by MoCoGenSo Webmaster. Here is an interesting announcement. 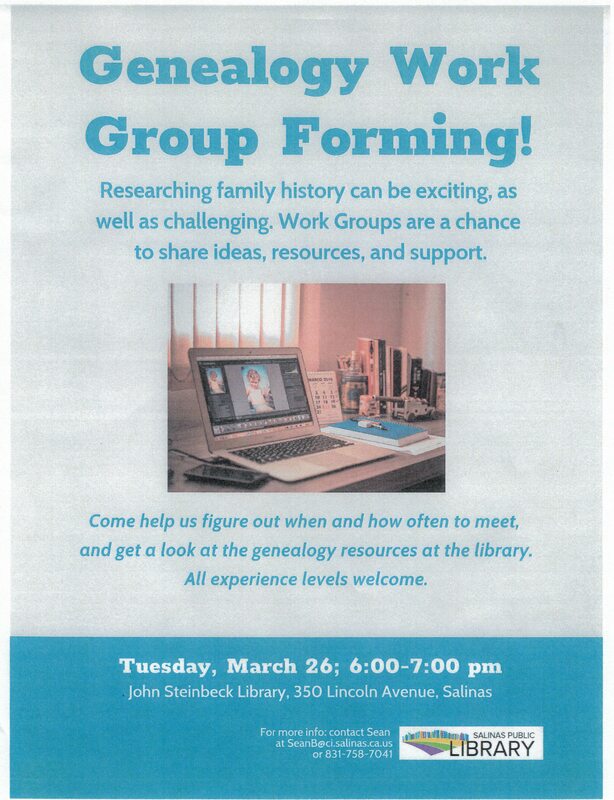 There is a “genealogy work group” forming in Salinas and you can be part of the founding group! Disclaimer: This group is not affiliated with MoCoGenSo, we are simply supporting the local genealogical community. Personally, if I lived in Salinas, I would attend this first meeting. This entry was posted in Other on March 10, 2019 by MoCoGenSo Webmaster. This is a reminder for the MoCoGenSo DIG meeting March 9, 2019 at the Seaside FHC at 10:00 am. This entry was posted in 2019, DNA, Meetings on March 8, 2019 by MoCoGenSo Webmaster. Heads up folks. Those of you who are interested in DNA and Genealogy should try to watch a new video about third party tools for genetic genealogy. You have to hurry, it is FREE for only 5 more days (as I write this), free until March 12. The webinar is by Michelle Leonard, a Scottish genetic genealogist. It is provided by Legacy Family Tree Webinars. You will still be able to watch the video after March 12, but a subscription to Legacy Family Tree Webinars will be required. It is an excellent, fact filled overview of the main 3rd party tools for DNA testing. It is 1.5 hours long. The video is long, but it is like attending 2 or 3 of our DIG meetings! Keep a notepad handy. This entry was posted in DNA, How To on March 7, 2019 by MoCoGenSo Webmaster. www.rootstech.org/video-archive Look in the section called Rootstech Sessions. As an aside, I got all excited and ordered a MyHeritage test kit after hearing about all the new things they just announced! Color me sucker. PS., I really do love AncestryDNA’s new ThruLines too. I am going to be busy this year! Diahan Southard takes you through your DNA match list and explains the Shared Matches tool. Learn how to create and employ a number of tools to boost your confidence in your genetic genealogy skills. Join Crista Cowan (the Barefoot Genealogist) and preview Ancestry’s cool new tools that are geared to improve and accelerate your family history research. Blaine Bettinger will explain how to use DNA evidence correctly and correlated with documentary evidence. In this session he will examine some of the considerations, limitations, and pitfalls we should consider when using DNA evidence. One of the best ways to maximize MyHeritage is to host your tree at MyHeritage, where the systems will automatically help you find new records, fill gaps in your existing tree, and provide matches that can help you efficiently discover new ancestors and family members. In this session, Mike Mansfield will help you learn how to move your tree from online tree systems to MyHeritage and how MyHeritage works with your tree to find new and additional information that you can easily evaluate and add to your tree. DNA Painter is a website that can help interpret and demystify your autosomal DNA results. Using practical examples, Jonny Perl will demonstrate how DNA Painter can be used for a variety of activities including chromosome mapping and relationship prediction for unknown DNA matches. In this session, Sarah Lashkey will walk through how research works at 23andMe and how you can contribute to scientific discoveries. Presenter: Michael Lemar Strauss. This session will be recorded and available to view on demand after the conference. Presenters: Christi Lynn Jacobsen, Dana Leeds, Diahan Southard. This session will be recorded and available to view on demand after the conference. This entry was posted in 2019, DNA, RootsTech on March 2, 2019 by MoCoGenSo Webmaster. The Monterey County Historical Society was founded in 1933 and its collections are vast and varied. They are essentially the custodians of the majority of local/regional records from the 1770s through the 1930s. This presentation delves into the history of the Historical Society, and resources they care for, and how we can assist researchers. James Perry has a M.A. in Museum Studies with an emphasis on Collections Management & Public History. He has served as Curator of Collections & Exhibits for the Valdez Museum & Historical Archive in Valdez, Alaska, as well as, the Museum of the Aleutians in Dutch Harbor, Alaska. Locally, he has served as consultant to various organizations for special project initiatives, including the City of Carmel-by-the-Sea, the Royal Presidio Chapel and Missions Carmel, San Juan Bautista, Soledad and San Antonio de Padua. He has served the Monterey County Historical Society in various capacities in 1990, and is currently the Society’s Archivist & Curator. This entry was posted in 2019, Meetings on March 1, 2019 by MoCoGenSo Webmaster.